A couple of years ago, back in 2016, Wu-Tang Clan founder RZA paid tribute to the 1978 Shaw Brothers action flick, The 36th Chamber of Shaolin, by live-scoring the film from start to finish, at LA's Beyond Fest. 2 years on, RZA is taking the concept out on the road for a string of dates this April. The group's vast collection of music goes back over 20 years, including the Clan's latest album, The Saga Continues, so RZA won't be without a huge selection of the group's massive catalogue to choose from, in order to give the film's score an update for the present day. 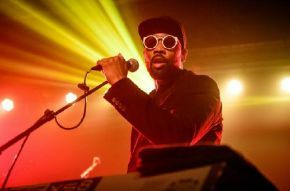 RZA's tour is set to begin on April 17 in Denver, CO and will stop in Washington, DC, Miami, Los Angeles and San Francisco, where he'll wrap up the short tour. As a young kid growing up in New York City, RZA got to witness the world of martial arts on the big screen and saw The 36th Chamber of Shaolin when he was 12. The multi-hyphenate star became enamoured by the culture and was impacted by the film's story about the oppressed Chinese villagers and the Manchu authority. "Beyond the kung-fu, it was the reality of the situation that hit me," RZA said in a statement. "Growing up as a black kid in America, I didn’t know that that kind of story had existed anywhere else." Check out the dates for the RZA: Live From The 36th Chamber of Shaolin Tour.